CHICAGO – Mark Neiweem, a 29-year-old native Chicago activist, was released this morning, December 12, from Pontiac Correctional Center after serving 19 months of two concurrent 3-year sentences. In the lead-up to the NATO protests of May 2012, Neiweem was one of several activists targeted by undercover police officers for his political views and as part of a larger effort to justify the millions of taxpayer dollars spent on police during the NATO summit. In the last few years, as news of Drones Warfare perpetrated by the United States has reached my ears, my heart has been opened to exactly what it is I can do to take responsibility for mending this pain. I have been so fortunate to unite with folks who actively work to heal this issue that we as Americans face today. Those people are a core group of members from Veterans for Peace, Grandmothers for Peace, Code Pink, and generally well practiced activist elders. Until recently I was the youngest regular participant at age 40. 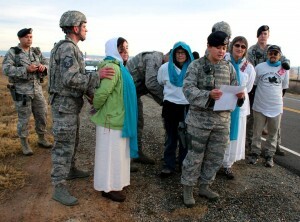 We vigil monthly at an Air Force Base near my home and we call ourselves Occupy Beale Air Force Base. On the afternoon of December 9, 2013, two Yale Divinity School students and a Catholic Worker were arrested as they attempted to deliver an Order of Protection on behalf of Afghan children and their families at the Hancock Air Base main entrance on East Molloy Rd. near Syracuse, New York. 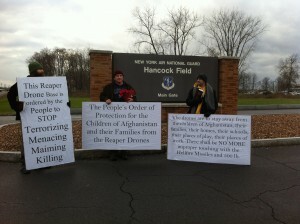 In addition to the Order of Protection, the three carried with them their signs, a supporting letter from an Afghan family, and flowers. As they approached, the military guards closed the gates and refused to accept anything from the three, not even the flowers. Kimberly Rivera was released from military prison on Thursday, December 12, after serving over seven months of a 10 month sentence, with credit for good behavior and performing extra work. PFC Kimberly Rivera gave birth to her son Matthew on the evening of November 25. After last-minute pressure from outside supporters and her attorney, husband and father Mario Rivera was allowed to be present for the birth. Then, on Thanksgiving Day, November 28, Fort Carson Senior Commander Brig. General Michael A. 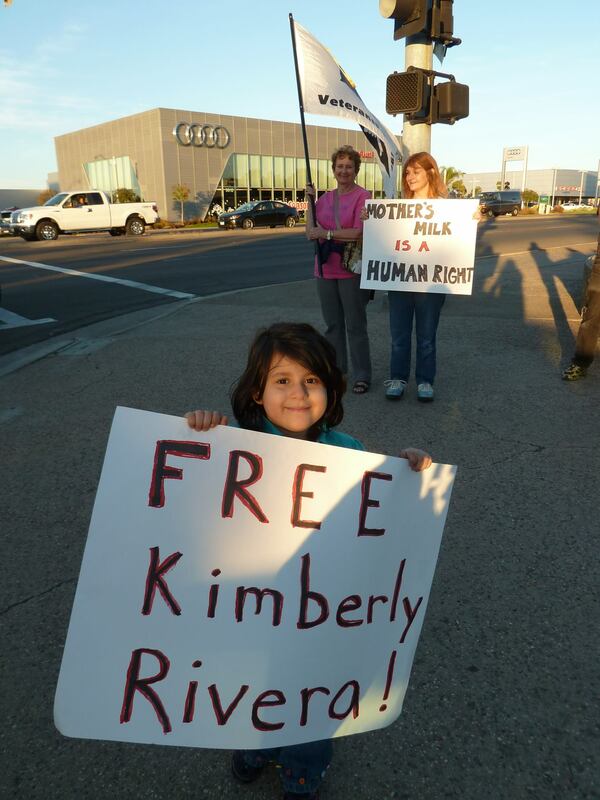 Bills acted with extreme cruelty to deny Rivera’s request for clemency that would allow her to be excused from serving the last few weeks of her sentence so that she could be with her newborn son. She was taken from the hospital back the brig that morning, and their son was given to his father. 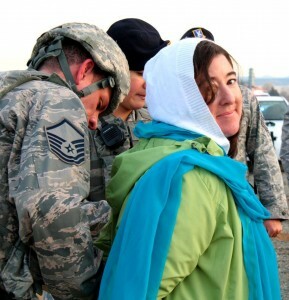 Activists in California blocked “business as usual” for over 30 minutes at Beale Air Force Base on the morning of November 26, where the crew of the Global Hawk drone program assist in illegal targeted drone killing by doing surveillance of potential targets. Four activists – Mike Kerr, Flora Rogers, Shirley Osgood and MacGregor Eddy – were arrested while attempting to deliver a letter to the commander of the base, demanding a halt to these brutal drone killings that are assisted by airmen at Beale Air Force Base.